Captain Seats, Curtains & Blinds In Cab, Flush Glazed windows, Rear Cab Bench Seat Converts To Bunks, Removable Table, Spot Lights In Cab. Each Super Sonic horsebox has the option of adding an Excel pack providing lots of extras. 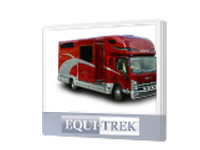 View/Download the Equi-Trek Super Sonic Five pages of the Equi-Trek Brochure and the Excel pack. 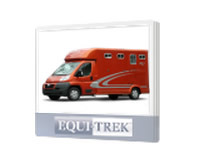 Also see the other Equi-Trek models we have for sale.